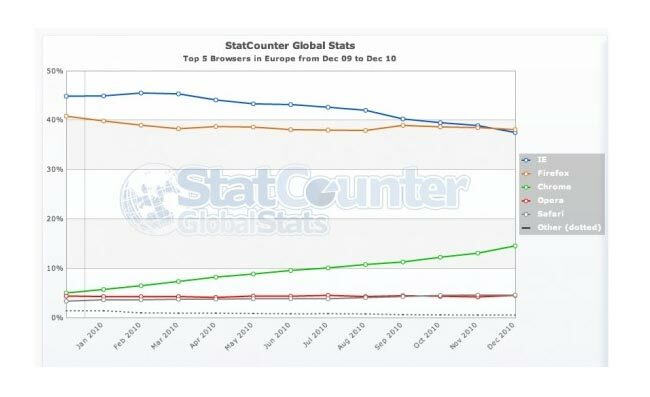 According to StatCounter, the free website analytics company, Mozilla’s Firefox browser took the number one spot with 38.11% of the European market pushing Internet Explorer into second place with 37.52%. But Firefox might need to thank Google Chrome for its help as Chrome is stealing users from Internet Explorer while Firefox is simply maintaining its existing user share. But the main winner in the graph above is definitely Google Chrome, although its in third place its gaining market share in Europe and has grown to 14.58% compared to 5.06% in December of last year.